Research shows that children are more successful in school and beyond if they are given a strong foundation in the earliest years of their lives. ESSA includes new opportunities for states to strengthen and expand access to public early childhood education. 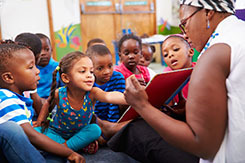 AIR’s early childhood experts have provided support in 20 states and AIR’s staff is available to support requests that its comprehensive and content centers may receive from states that focus on early childhood topics. The AIR team works with early childhood service providers and policymakers nationwide to find solutions to practical challenges in early childhood education and care. Which programs and policies can we adopt from other countries to increase access to preschool programs in the U.S.?